In this presentation from 2009, Edward Rogers, the CKO at Goddard flight centre, describes three core elements of NASA's KM toolkit. The presentation describes the process elements of the NASA KM Framework, which are also shown in the diagram above. Pause for Learning events are NASA's version of After Action Review and Retrospect. 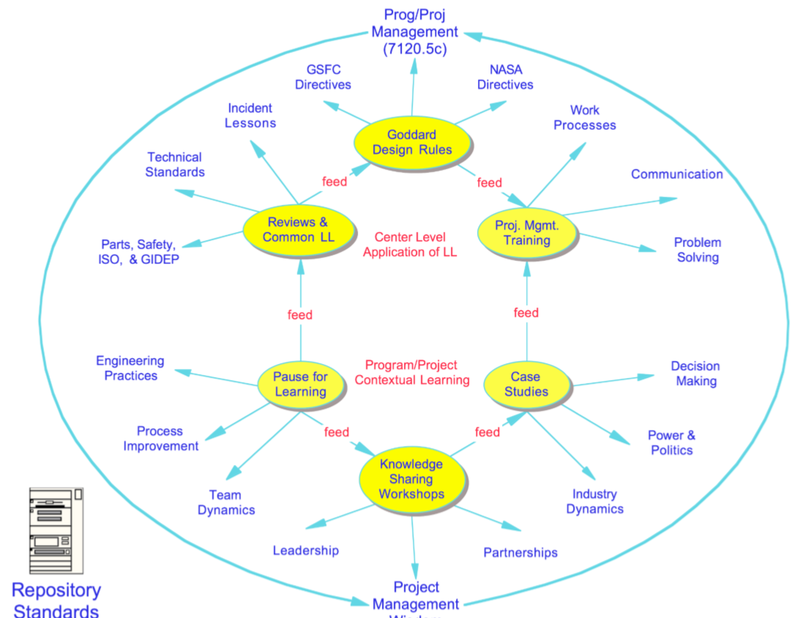 These events are inserted into process at major reviews and project gateways. and after incidents or mishaps. They are based on five cultural ground rules - they are not a reporting activity, they are non‐attributional, they are done close to the action, and involve participant discussion with an objective facilitator. Case Studies are an opportunity for protagonists to share their stories, and to examine why things went right (and not just assuming it was always because of great planning and execution) and to discuss things that were less than perfect but still worked. Knowledge SharingWorkshops (what we would call Knowledge Handover workshops) are where a project team shares their experiences in a panel discussion, focusing on the knowledge and learning which they have gained. These discussions are facilitated, and last a couple of hours.